I hope everyone had an awesome Thanksgiving! I for one do not like Turkey (I know, I'm weird!) so I had mostly sides but I still feel so stuffed! Also, happy Black Friday! Is/was anyone brave enough to head out to the stores today? I'm certainly not brave enough. I did quite a bit of online shopping last night right at midnight though! I plan to scour the internet for more deals today. 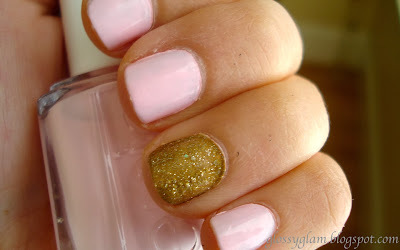 To get this look I used Nailtini in Champagne (which I got in my November Ipsy bag) on all my nails. I then put Orly Garnet Truth on my accent nail. I've had this color for months but I never tried it and now that I have, I LOVE it. It's a pretty red color with a few subtle sparkles. It will probably be a color that I use a lot this holiday month. I will admit though that though the Nailtini color is pretty, it sort of doesn't show up against my skin color, they almost match ha! Ok, thanks for stopping by and I hope everyone has a great and safe weekend! Goodness gracious, I've been nominated for another award!! The Versatile Blogger Award is to honor those bloggers who bring something special to your life whether every day or only now and then. 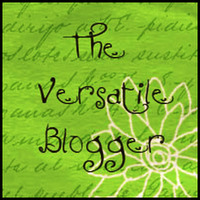 The Versatile Blogger Award has it's own blog. I was given this award from the lovely Shalunya from Shalunya and Boyet. You should def. 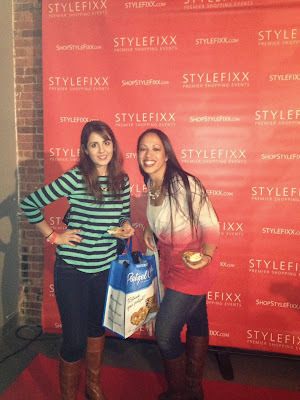 go visit her blog, she’s got so much to say about beauty and has tons of great info about blogging in general! Thank the person who gave you this award. That's common courtesy. Include a link to their blog. That's also common courtesy. Select 15 blogs/bloggers that you've recently discovered or follow regularly. Nominate those 15 bloggers for the Versatile Blogger Award - you might include a link to the site. Finally, tell 7 things about yourself. 1. I stay local for the holidays. 2. I can run scientific experiments but I can’t cook at all. The best I can do is pasta. 3. I hate cleaning. I’m not the least bit domestic. 4. I wish I had a blogging partner who could take and edit the photos for me, I know I’m just terrible at it. 5. I just recently got into Breaking Bad and I’m obsessed! 6. I’m in my 30s. 7. One of the biggest reasons I’m looking forward to the holidays is because I’ll have lots of days off which I plan to fill with blogging related things! I know I’m supposed to nominate 15 bloggers but I’m finding that when I’ve nominated bloggers in my previous awards, very few did them and often they’d already been nominated for the award. So this time, I’m nominating everyone who is kind enough to stop by my blog and read this! If you do this award please let me know because I’d love to stop by your blog and learn more about you! 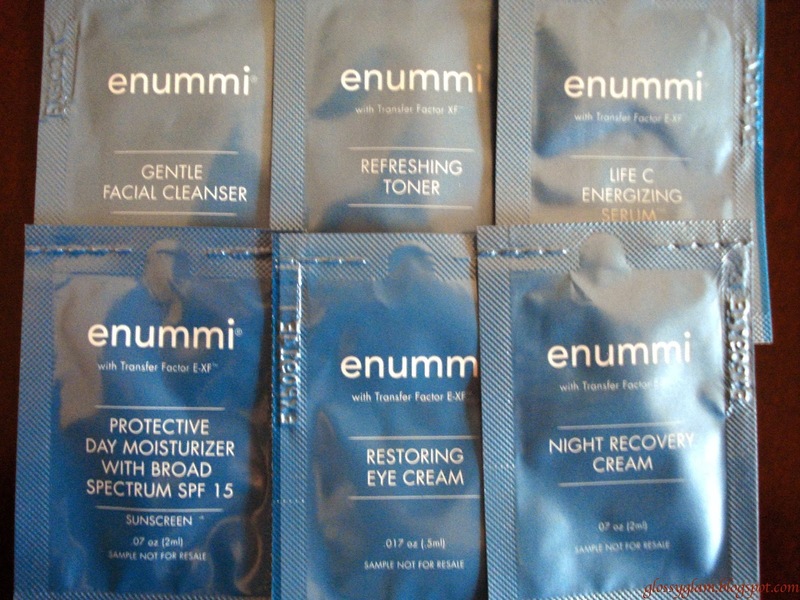 I recently received some samples of Enummi Skincare from the lovely Heather Findlay who works with the company as a consultant. 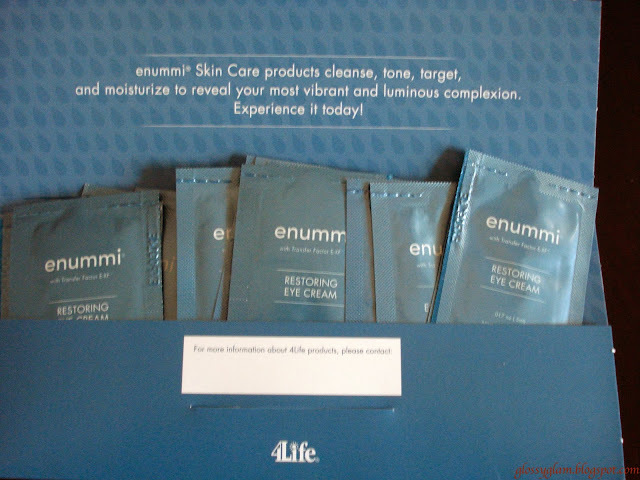 According to the website: enummi is a line of highly innovative skin, body and lifestyle products that perfectly blend natural, enhancing and nourishing botanicals with proven scientific findings. Our product line delivers results and quality that are comparable to, or even better than the luxury brands—and at a much lower price than you would expect. Also, a portion of their profits go to an organization called Foundation 4Life. This organization builds and supports orphanages for abandoned children suffering from AIDS. Natural botanicals? Good cause? Sounds great to me, I was excited to try this stuff! I really liked the entire skincare system. I was skeptical of the facial cleanser because it said "gentle". I have found that anything that says "gentle" doesn't take off my makeup and leaves a gross slippery film behind. I don't about you guys, but when I'm done washing my face I want it to be squeaky clean (though I know that most dermatologists would cringe at this)! I usually wash my face twice. Once with face wash, my hands, and water. I then repeat with my face wash and Clarisonic. Even after that first wash my Clarisonic looks so dirty and brown from my foundation (sorry that sounds gross). All that means to me is that my face wash doesn't do a very good job of removing my makeup during the first wash. However, when I washed with the enummi cleanser, my Clarisonic didn't get brown at all! In fact, it almost look whiter after I washed my face with it! The toner was refreshing and the Energizing Serum was super soft and felt kind of like a primer. I'm always in the market for a better eye cream and I do wish I had a larger sample size of this one because I felt like it would have actually made a difference in my circles and fine lines. By far my favorite parts of this set were the day and night moisturizers. They felt so silky going on and absorbed right into my skin. To be honest, I rarely get impressed by skincare. I feel like if anything REALLY worked or was THAT great, then there would be no old looking celebrities (since they can pretty much get their hands on or afford any brand they want). I often just use whatever moisturizer I currently have hanging around or is on sale, I definitely don't spend a lot on face cleansers or toners either. That said, I did really like this skincare set. I would definitely purchase the face wash and moisturizers and the prices are really reasonable! If you are interested in this line of skincare you won't be dissapointed! You can find Heather's contact info HERE. Makeup collection and storage posts are my absolute favorite types of posts to read and/or watch from my fellow beauty bloggers. I've never done this type of post and I figured I'd do it now so I can see where I'm starting out because I have a feeling I will be adding quite a bit to my collection in the near future. 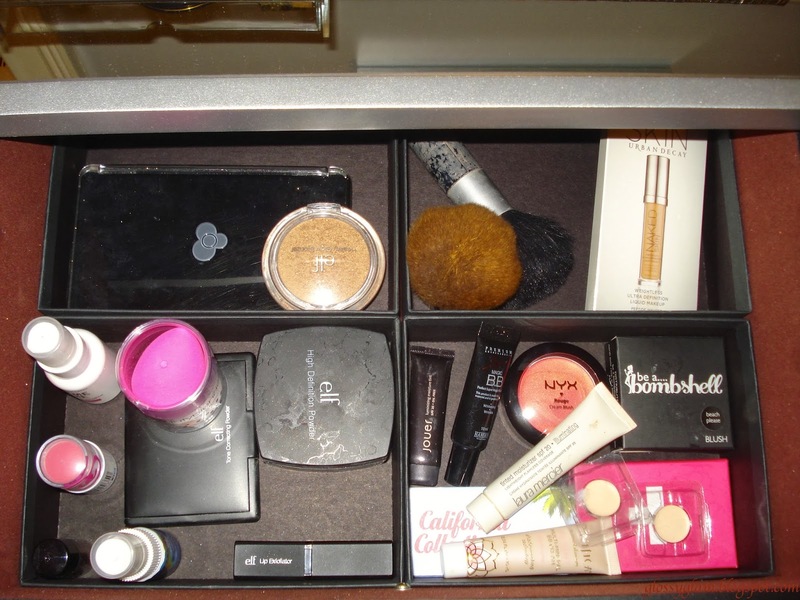 Update: Click here for my updated 2015 Makeup Collection & Storage post! *Please keep in mind that my makeup collection is probably less than 1/16th the size that you usually see from beauty bloggers! **I've seen some other makeup collection posts get really nasty and negative comments assuming that the blogger is showing off. I do NOT look at these types of posts that way at all. When I see makeup collection posts, I like them because I'm curious (aka. nosy) and I love looking at how others organize and store their collections (for ideas and tips). I hope that you all feel the same way. 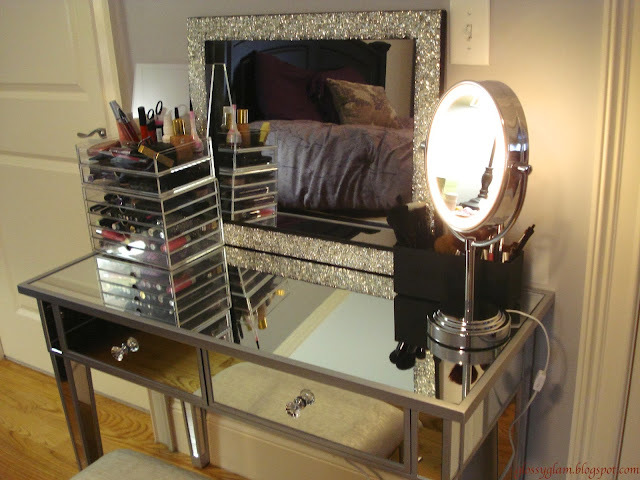 Here is a new vanity I treated myself to. 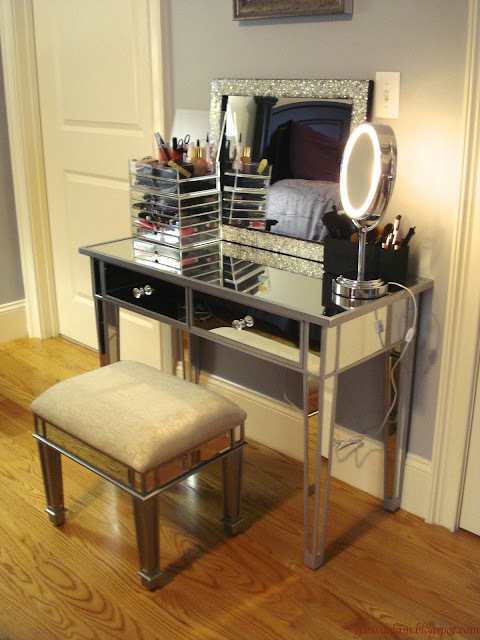 The table is actually a knock off from the Hayworth one at Pier 1 Imports, I got this Mirrored Vanity from Amazon for about half the price! 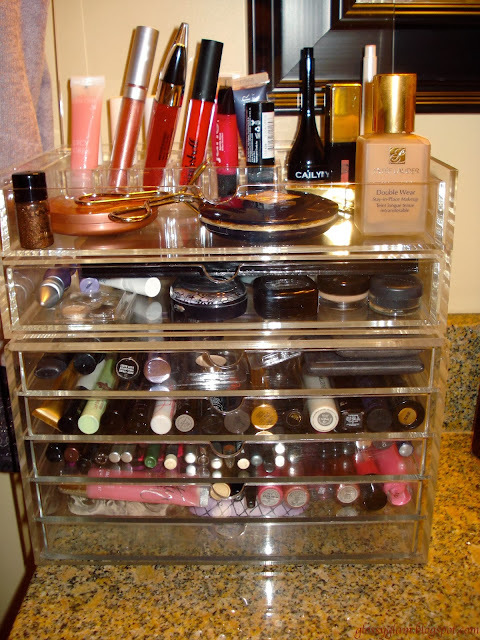 My makeup is stored in Muji Drawers which I gushed about HERE. I recently got a bunch of ELF brushes and with that order I got their black brush holder. The mirror is from Home Goods, and the oval lighted mirror is from Conair and I got it from it from Amazon. The chair actually is the one that goes with the Pier 1 Imports Hayworth vanity set but with coupons and gift cards I got it for super cheap. Yes, it's gorgeous and matches perfectly but in hindsight, such a light color cushion is probably not ideal to be applying makeup on. Oh well! Now onto the makeup. I'm not going to go into super details, I think that's much easier done in a video. When I originally took these photos my Muji drawers were in my bathroom so that's why you are seeing a granite countertop and not my mirror vanity. Below is the top shelf of my Muji drawers. I've got a little lipstick holder which I've put some of my lippies and glosses. 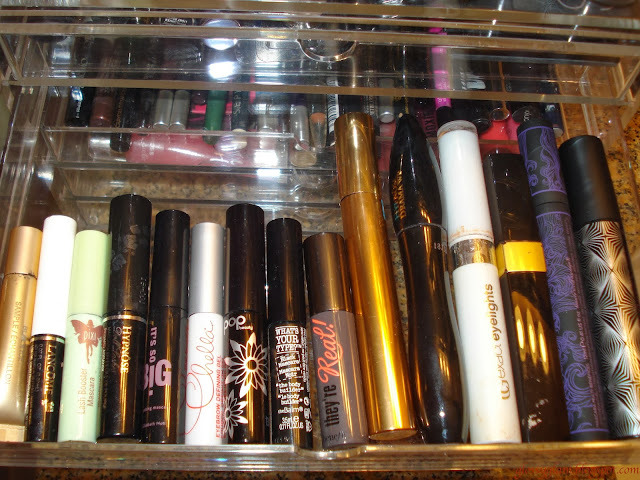 Some of these are Be a Bombshell, NYX, Lancome, Jane, etc. I've also got a YSL lipstain on the right side and a Cailyn gel liner and lip balm. 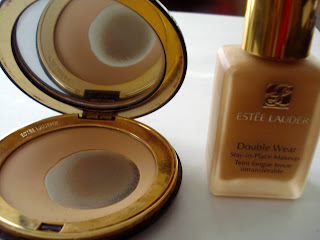 There's my HG foundation which is Estee Lauder Double Wear Foundation and also the matching powder. 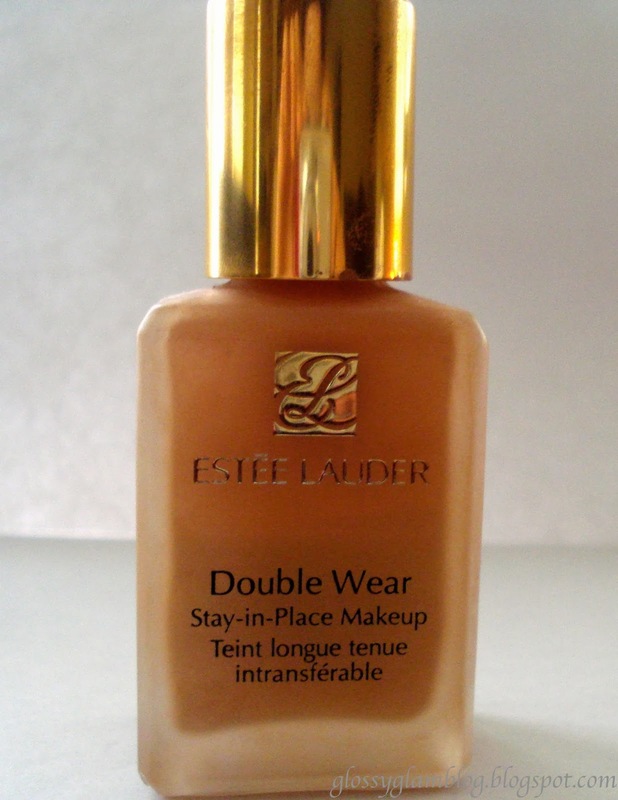 My current concealer is in the gold square tube from YSL which I don't love so I'm in the market for a better one. Also you will see UD Baked Bronzer which is perfection for my skintone and my fave eyelash curler from Shu Uemura. The first drawer is where I keep my shadows. Here is where I keep my beloved Naked Palette, and some NYX, UD, Lancome, and Bare Minerals Singles (which I never use b/c I hate loose powders). On the left I have 2 UD sample size primer potions and my Bare Minerals eye primer. On top of the above shadows in the same drawer is where I put my ZPalette which I discussed HERE. 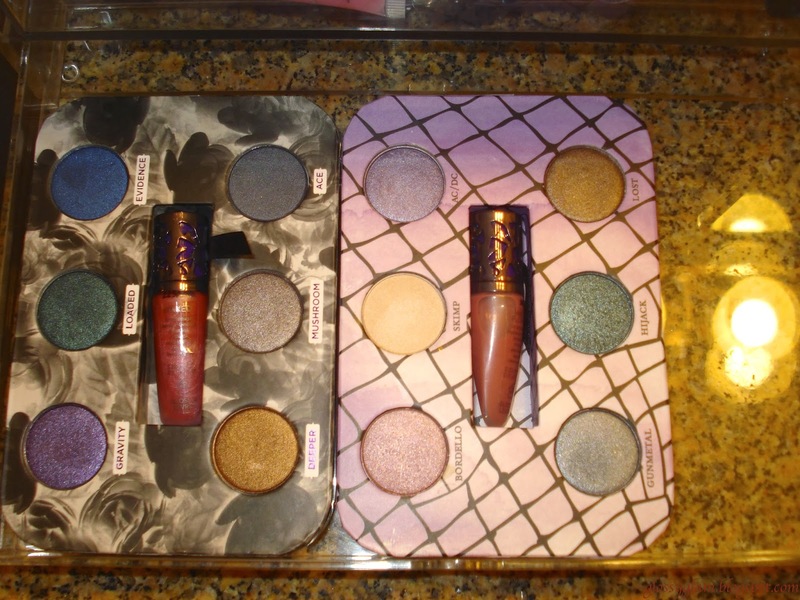 In there I've got lots of Lancome, Estee, and UD shadows as well as some drugstore brands. I know it's very messy looking but it's much better than having a million small plastic palettes hanging around. The next drawer contains all my mascaras. Most of these are samples which I talked about HERE. The rest consist of YSL Faux Cils (my HG), Lancome Hypnose Drama, CoverGirl Eyelights (Not sure if they still sell this but I love it. It's VERY subtle, it doesn't clump, and gives a nice feathery look), Channel Inimitable (my 2nd place HG), and 2 new ones I got during an UD sale. Here I have all my eye liners and there are a couple of gel liners in there too. Most of my black liners are on the right and the fun colors are on the left. 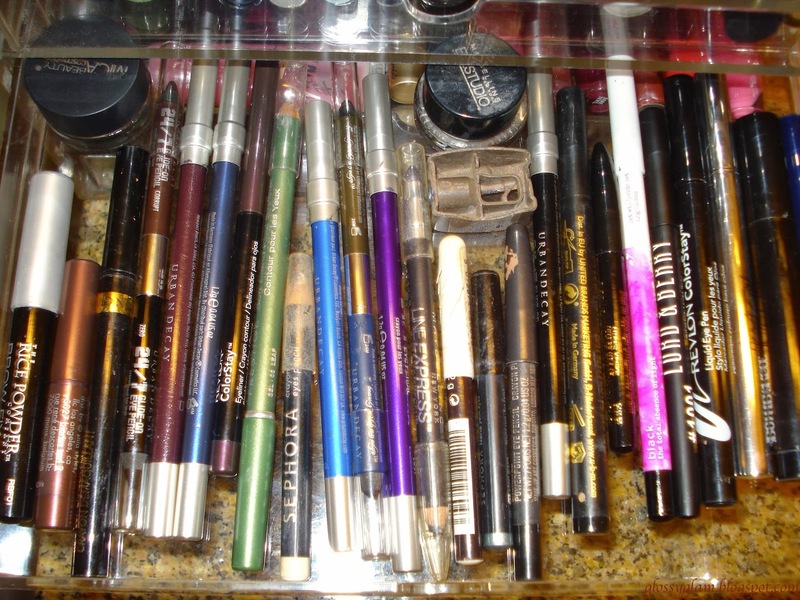 As you can see, I'm quite the UD 24/7 eye liner fanatic! In this drawer I have the rest of my lip products such as MAC Lipglass, VS Beauty Rush, POP, Moxie, Borghese. On the left I also have a small UD palette which I talked about HERE. It came in a zip up container but I took the palette out of that because I wanted to be able to see the colors or else I'd never use them. I'm sure this isn't very hygienic with the exposed eye shadows, but oh well. 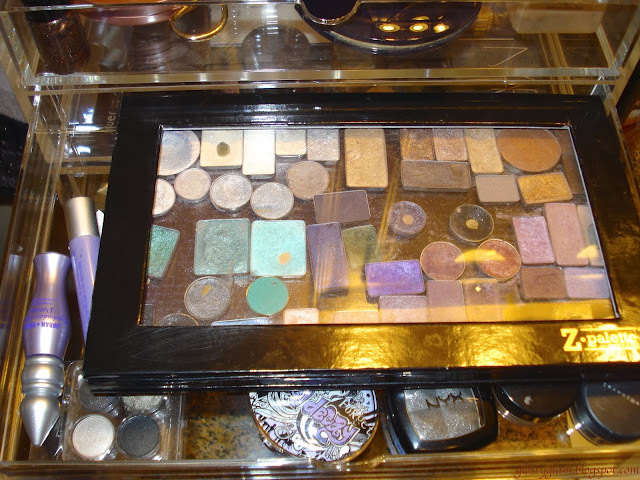 The last drawer contains more of those UD palettes that I took out of their containers. 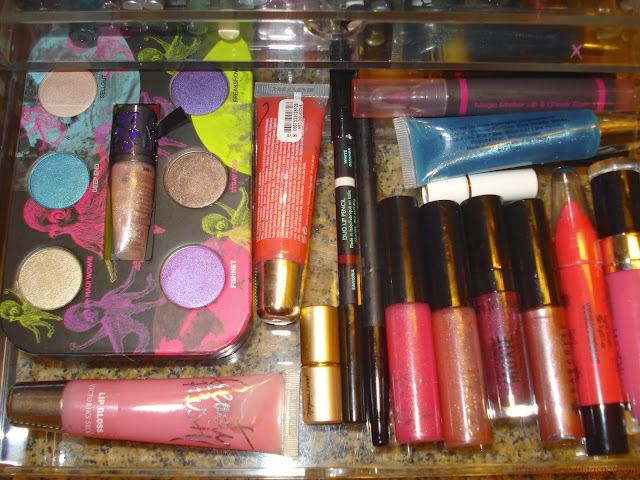 Here is what I have in the two drawers of the vanity. I was able to divide the drawer up with box tops that came with my Sample Society boxes. In this drawer I've got things like an Umi magnetic palette, some extra brushes, my Bare Minerals Primer, Beauty Blender, ELF powders, UD setting spray, some BB creams, tinted moisturizers, blushes, and some more eye shadows. 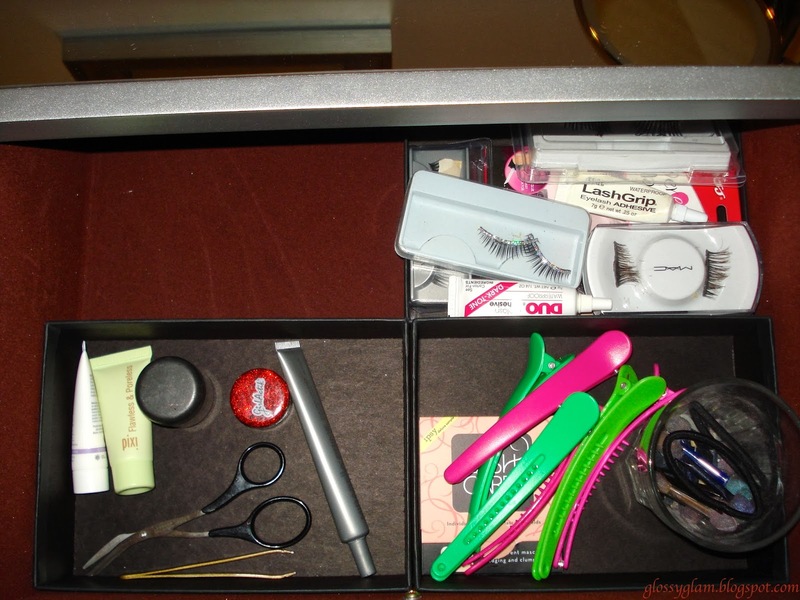 In this drawer I've got all my lashes, tweezers, scissors, some hair clips, primers, glitters, hair elastics, and barrettes. Again, I apologize if this is a boring makeup collection. I don't really have much of an excuse because I've been a makeup fanatic for years, I just used to be much better at controlling my obsession. Now that I've been beauty blogging, that self-control has gone out the window! 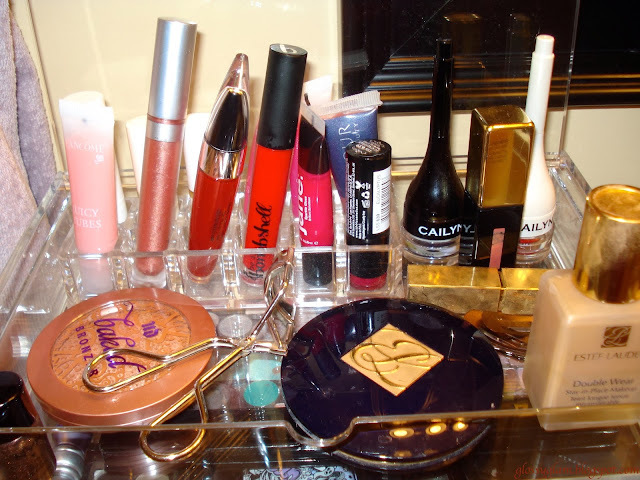 Click below to see my updated makeup collection posts! 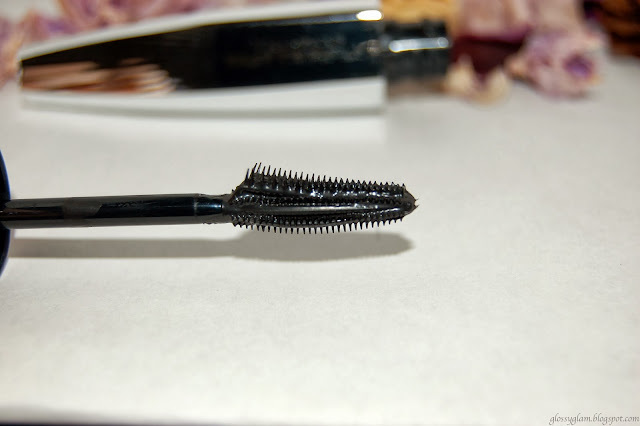 Today I'm going to talk about the L'Oreal Voluminous Butterfly Mascara. Tons of other beauty bloggers have already reviewed this mascara and loved it. Here are my thoughts. I bought this for $7.99 at Target. First, the brush of this mascara is of the spiky plastic variety. The shape of the wand is sort of like a wing and it's supposed to really grab those outer side lashes. L'oreal claims that this will achieve "dramatic fanned out volume". 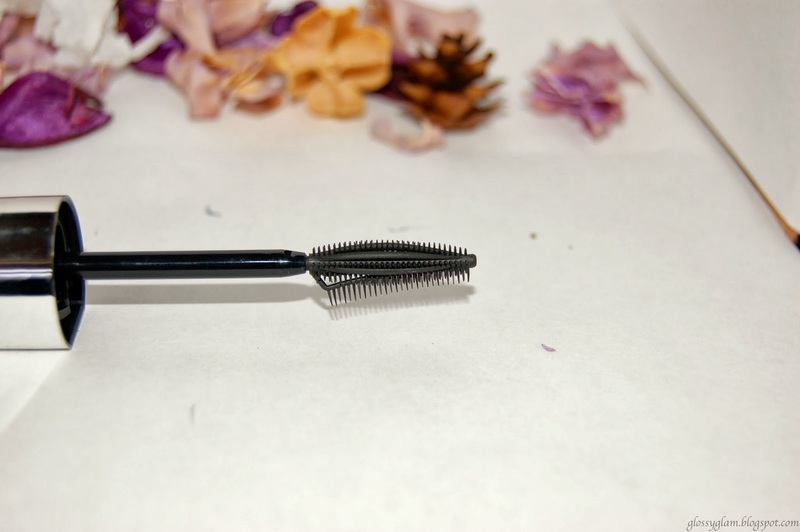 They say this of the formula: "unique Cocoon Fibers™ instantly wrap lashes in a soft, delicate veil to create silky, spectacular lashes that flutter." 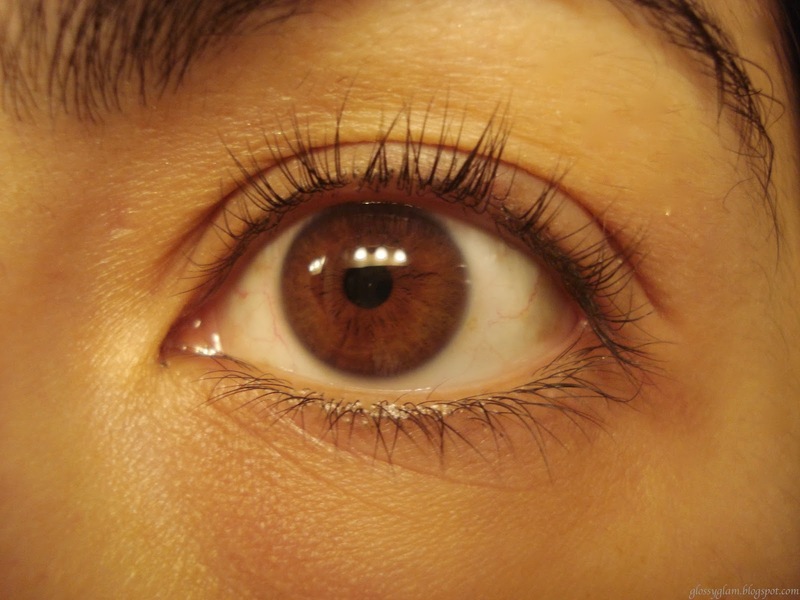 Um, ok.
Below are photos of my bare lashes, and then lashes with one and two coats of mascara. Below are my lashes after one coat of the mascara. They look good, dramatic, black. 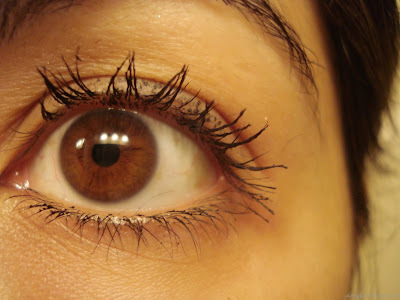 This a very wet mascara which causes it to be very messy and as you can see I got a lot on my upper lid. 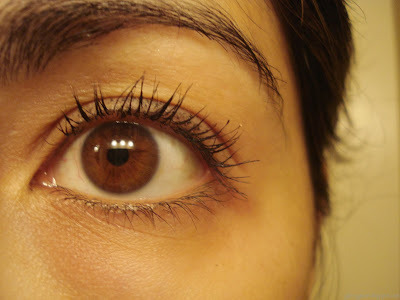 Check out how 2 coats of this mascara looks on me. It was a disaster, talk about tarantula eyes! This wasn't just a fluke either, I tried this a few times and each time, the second coat looked terrible. Am I missing something here? How is this so popular!? I've worn just one coat to work a few times in hopes that the formula will dry out a little so I can try doing 2 coats again, we'll see. Although, even just the one coat some days makes my lashes spiky by sticking them together unless I'm super careful. And I have to be careful not to get any on my eyelid either! This mascara is just way to fussy for my liking. Bummer. Little old me was nominated for another blogger award! 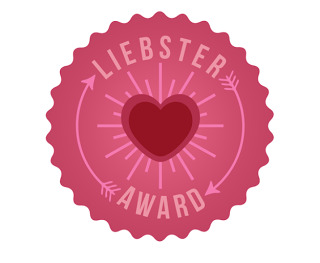 The sweet and beautiful Chelsea from the blog Tiger Love Beauty nominated me for the Liebster Award. 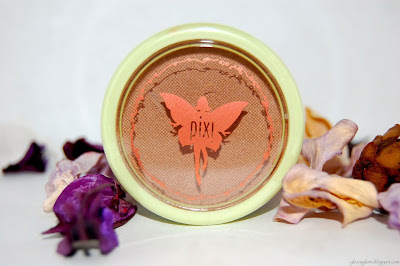 Please check out her blog, she has some great makeup and skincare posts and check out her Liebster Award post HERE! 4. Nominate 11 bloggers who you feel deserve this award and who have less than 200 followers. 1. I grew up in New England but will never stop hating the cold. 2. My favorite type of vacation is somewhere hot and beachy. Sadly though, I haven’t been on a beach vacation in in 3 years. 3. I’m a shorty at 5’2”. 4. I took kickboxing lessons for 3 years and was really into it. I regret quitting. 5. I dabbled in belly dancing for several years and even performed with my class in restaurants! 6. I took a hip hop dance class once and it was one of the most embarrassing nights of my life! 7. I watch at least 2 tv shows per night of the week. My DVR is always going. 8. I love scary movies and prefer them to girly rom-coms. 9. My fave food is mac and cheese. And pizza. 10. I never had a pet growing up. 11. Coming up with 11 facts about myself that I haven’t already listed in my Sunshine Award post is really difficult! 2. Have you ever played any musical instruments? I played the flute for a few month in the 5th grade. 3. What is your favorite thing about blogging? 4. What is your favorite makeup brand & why? 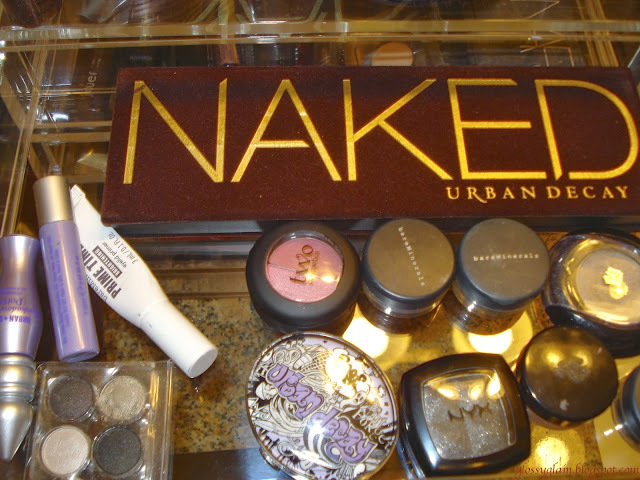 I don’t really have a fave brand for everything but Urban Decay is my goto for eye shadows. 5. Have you ever been out of the country you’re from? Yup, I love going on vacations! 6. What was your favorite subject in school? 7. 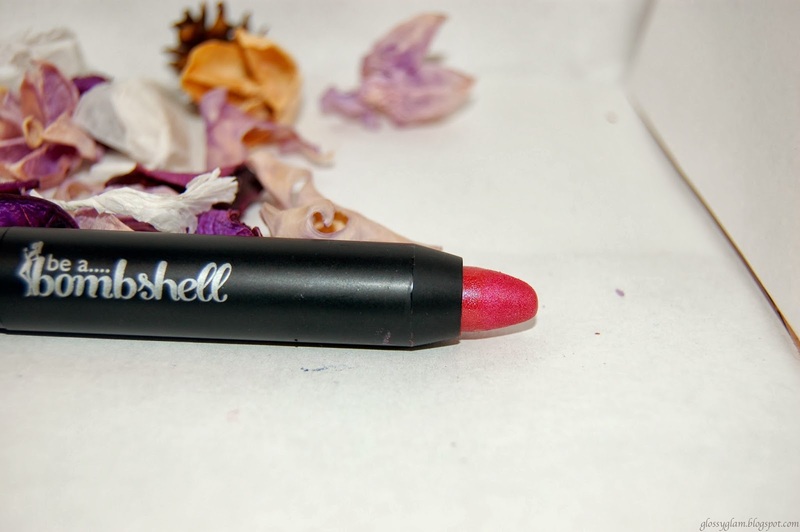 Do you prefer bold lips or natural lips? For myself, natural with some gloss is just easier. 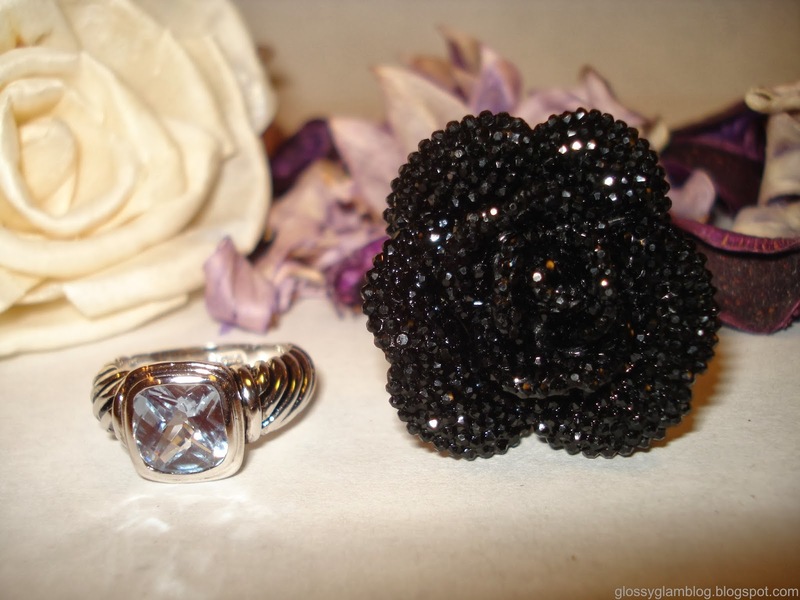 I do love darker colors but they are so high maintenance. 8. What is your current favorite song? 9. What’s your favorite snack food? Chips, I prefer salty snacks over sweets. 10. What advice would you give bloggers that are just starting out? Think long and hard about your blog name! I often find mine to be a little too silly. 11. Who is your favorite beauty guru & why? I look to all my fellow beauty bloggers for info and advice! 2. What is your favorite movie? 3. What do you love to do besides blog? 4. What is the ultimate goal of your blog? 6. Do you stay local for the holidays or do you have to travel? 7. What was your biggest beauty splurge? 8. High end makeup or drugstore? 9. What is your fave comfort food? 10. What was the best vacation you ever went on? 11. How long have you known your bff? Thanks for stopping by my blog and thanks again to Chelsea for the nomination! For all the beauties that I nominated, please let me know when you fill yours out so that I can check it out! One highlight of the weekend was that I got my November Ipsy bag. In case you haven't heard, Ipsy is a monthly beauty box subscription service. For $10 a month you get 4-5 beauty samples and often 1 or 2 full size items, all in a cute little makeup bag. It's such a fun service, I love seeing that shiny pink bag in my mailbox and ripping into it to see all my goodies! This month the bag's theme was "Glam It Up" which is appropriate with the holidays coming up. Also this month I think we all got 6 items in our bags which has never happened before! 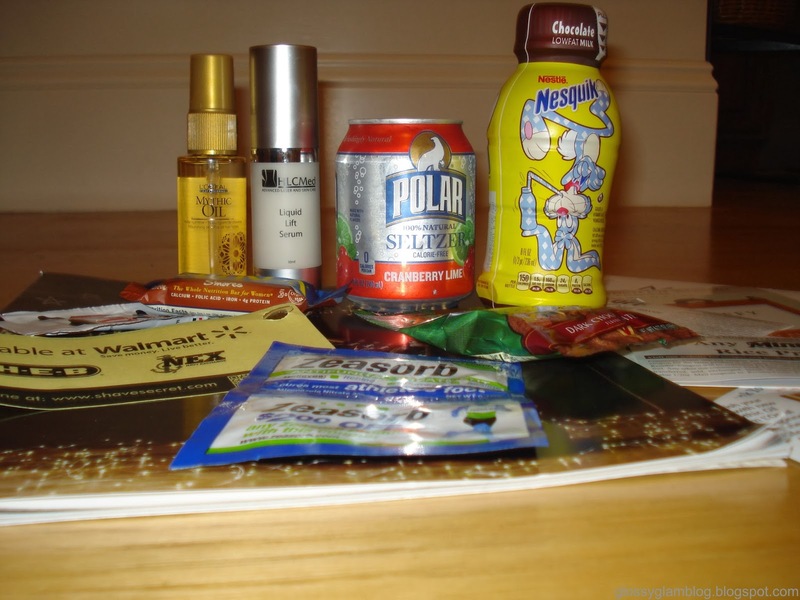 Here's what I got in my bag. 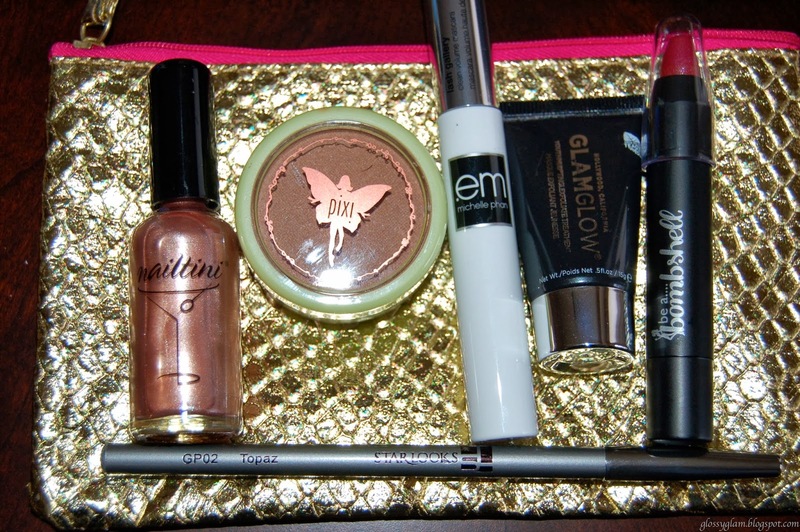 The gold makeup bag is super cute. I love the that the zipper is bright pink. I wouldn't even be opposed to using this as a wristlet on a night out. Ok, now onto the items in my bag. This is a full size item and it sells for $13. 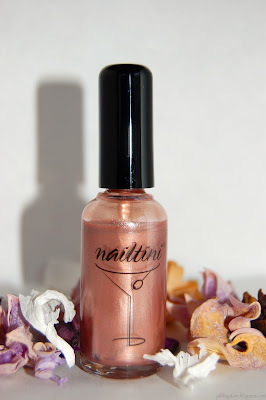 We've gotten Nailtini before and I'm a fan. I enjoy receiving nail polish, who doesn't! 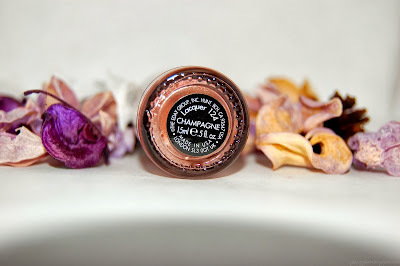 This is a coppery/pinky color. 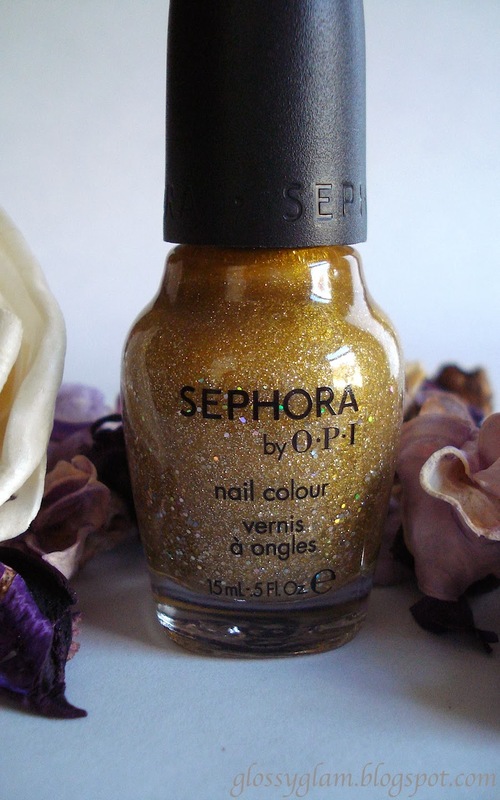 Very pretty and I'll be doing a NOTD with it very soon. This is a sample size. The full size comes with a kabuki brush and it sells for $18. Sorry, I don't have a swatch for this because I actually didn't open this bronzer. 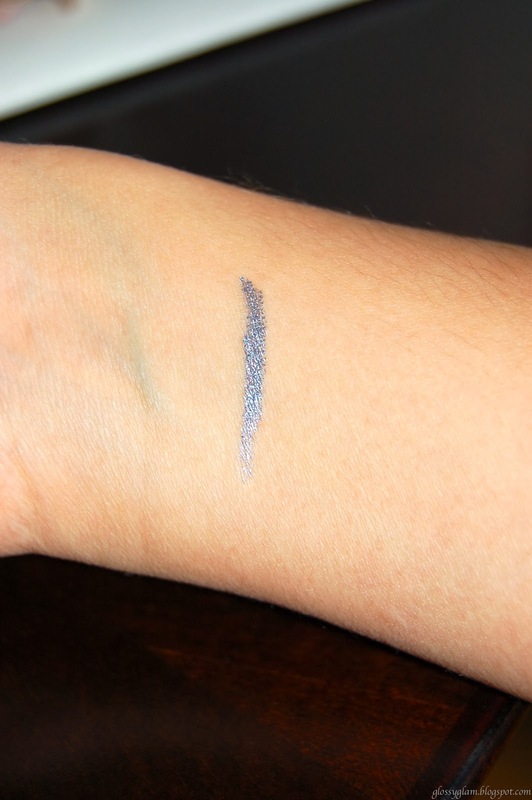 From what I saw from other beauty blogger reviews, it looks this shade is light and probably wouldn't show up on my skin. I'll definitely be gifting this. This is another full size item and it retails for $20. 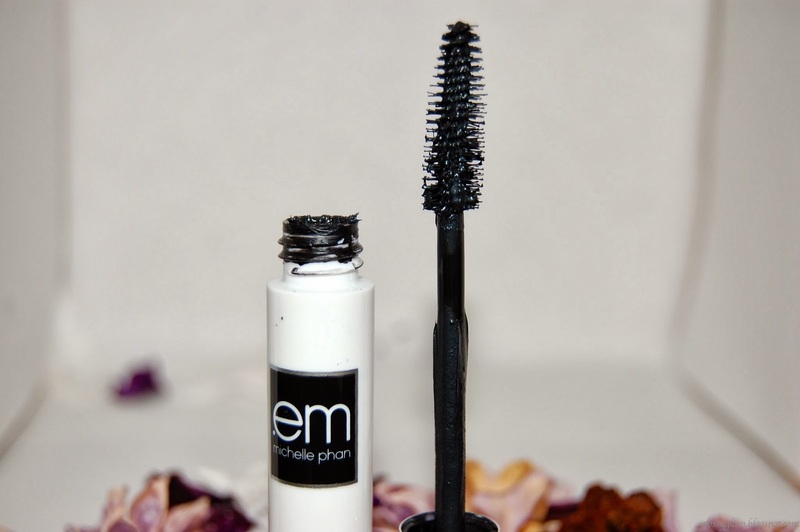 em Cosmetics is a new makeup line from Michelle Phan who is actually the creator of Ipsy. I don't think that this mascara is supposed to be that dramatic seeing as how it's called "clean mascara" and it certainly isn't. 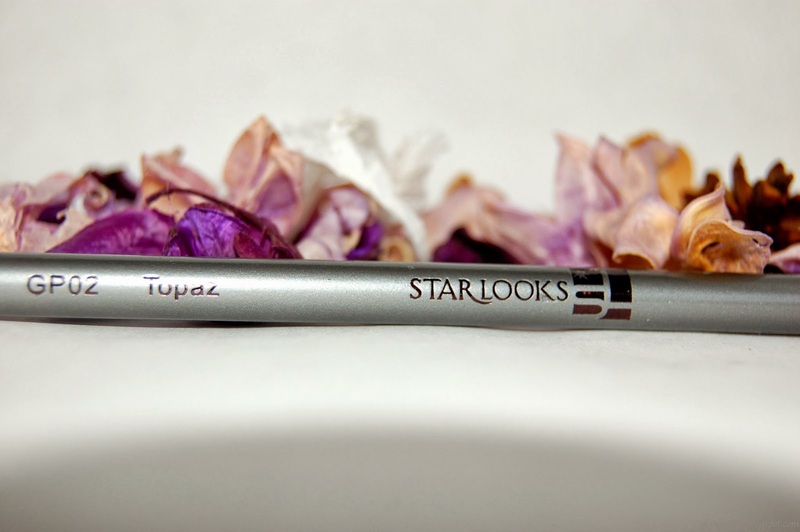 I tried it last night and it uncurled my lashes right away but my lashes did look darker. I'd say this mascara is mediocre. This is another full size item and it retails for $14. I haven't tried this on my eyes yet but the color is a gorgeous silver. I will be wearing this in my inner eye area for sure and perhaps layering with black on the upper lashline for a fun shimmery smoky eye. Another full size item and it retails for $14. 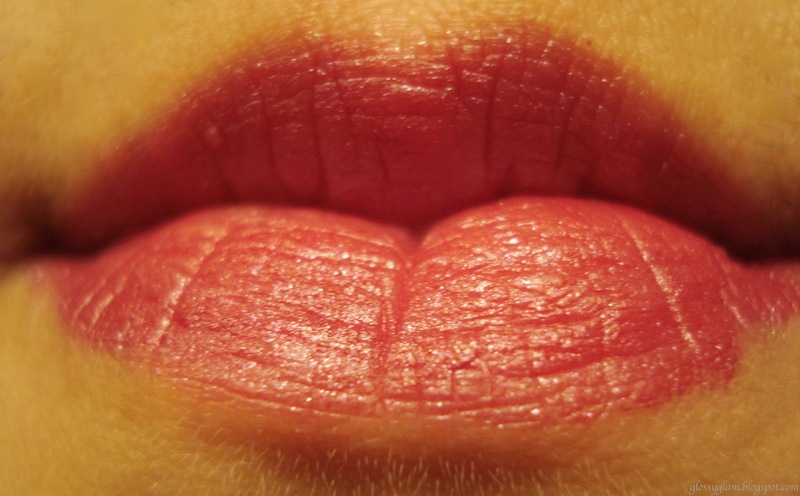 This lip crazyon is really soft and feels good on. 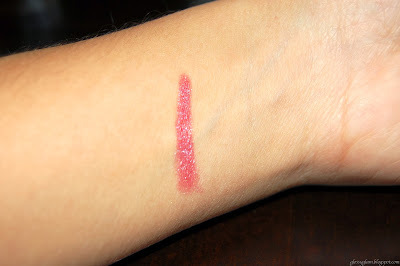 It's a very pretty dark pink color, not unlike my UD Revolution Lipstick in Manic. Again, on me it doesn't last long at all. My friend got the same crayon and it lasted perfectly on her for more than 4 hours! 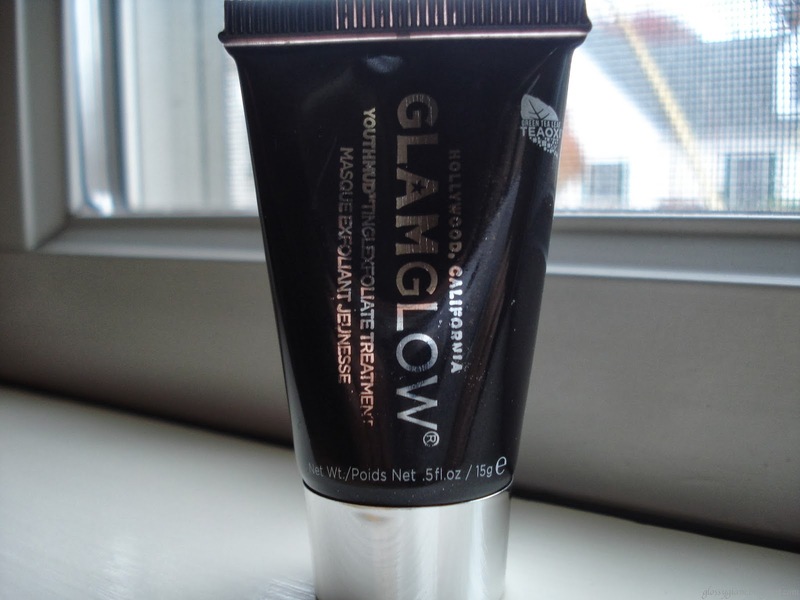 This 0.5oz tube looks like a sample size but there is a 0.5oz size in a jar available at Sephora for $19. So I guess you can say that this is a small full size?? Last night I was watching Youtube beauty blogger videos and Dani from Coffee Break with Dani had JUST reviewed and loved this! I feel lucky to have gotten this in my Ipsy bag because I haven't seen it in any of the other November Ipsy bag reviews I've seen. 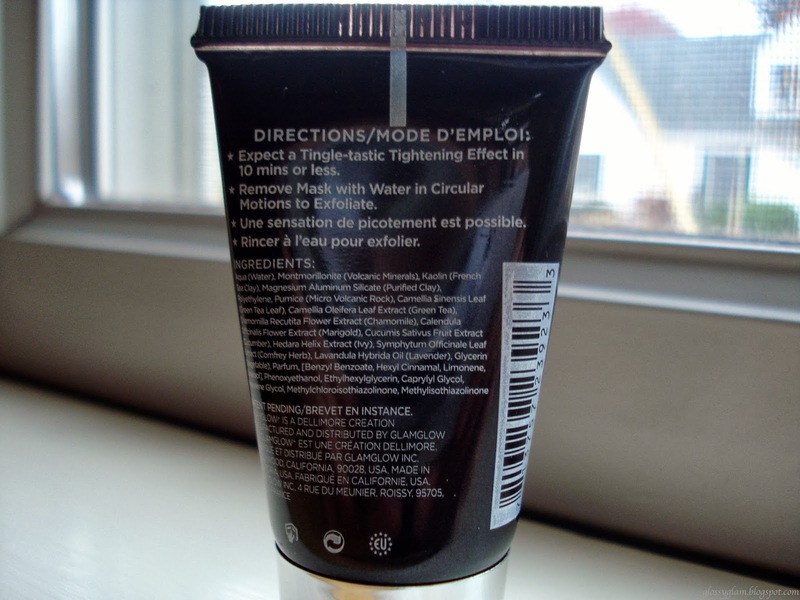 This is a mud mask that is supposed to tingle and leave your skin "radiant and glowing" (according to Sephora). I'm really excited to try this! Overall this was an amazing Ipsy bag! I got 4 full size items and the small GlamGlow is just the icing on the cake! Also, do the math...this bag is worth WAY more than the $10 I paid! 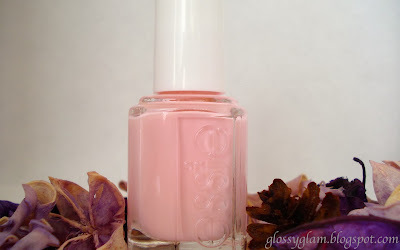 Today I'm doing a nail of the day post. This is the first time I did a "trendy" look and painted one nail on each hand a different color. Ok I know this NOTD is not "fall" or seasonal in any way, in fact, it's super summery but I don't care! This nail look includes Essie Fiji and Sephora by OPI in Looks like Rain, Dear. 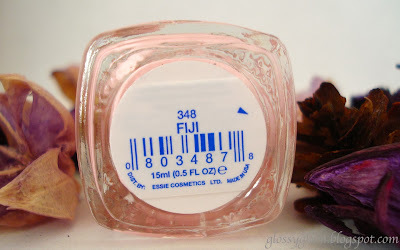 I feel like I'm the last person on the planet to get Essie Fiji, and I think it's one of their best sellers. I actually got it during the recent Beauty.com 20% off sale, which I may do a haul post for. The first time I ever heard of it is when I saw Emily Maynard wear it on the Bachelorette. Actually, every color she had on her nails that season was sooo pretty! 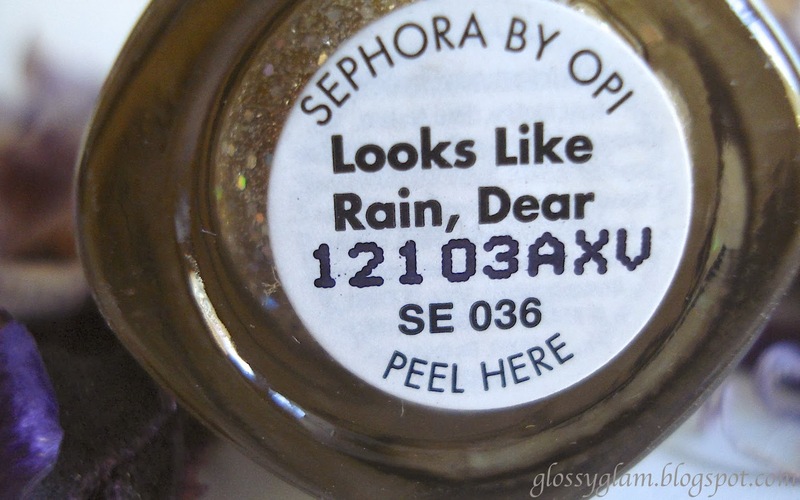 To get this look I applied a Sally Hansen top and base coat, 2 thick coats of Fiji, and 1 coat of Looks like Rain, Dear on my ring fingers. Fiji is beautiful! It's very girly and kind of a cotton candy pink. 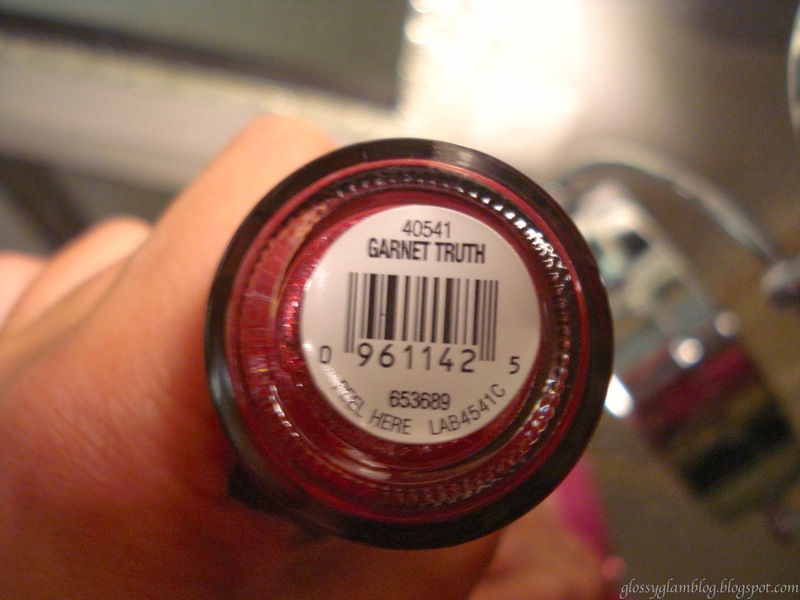 But to be honest, it's a very fussy nail polish. It's VERY streaky. I used 2 thick coats but I can still see slight streaks on some fingers. I could have easily used 3 coats. The fussiness of this polish is not going to stop me from using it. I definitely think the color is well worth the trouble of applying 3 coats. I would recommend this for sure. I hope everyone's week is going well! Today I'm going to discuss the very popular Beauty Blender. I have heard/read about this little pink sponge a thousand times and 99.99% of the reviews are positive. Almost everyone out there loves this thing! To say I was skeptical would be an understatement. What could POSSIBLY be so special about a sponge that would justify at $20 price tag?!?! Well, I finally broke down and purchased one when I had a 20% discount at Sephora. Even with the discount I didn't feel great about buying it. That is, until I used it for the first time a few days ago before work, and...I love it! Ok, back to the Beauty Blender! As instructed, I wet the sponge and squeezed out the excess water. I poured some of my Double Wear on the back of my hand and tapped the sponge on it and then dabbed it all over my face. Admittedly, this takes a lot longer than applying it with my fingers and definitely uses up quite a bit more product. It looked amazing though! I agree with everyone else who says that it gives a flawless airbrushed look. I even got a couple of compliments that day at work that my face looked airbrushed! That convinced me for sure! 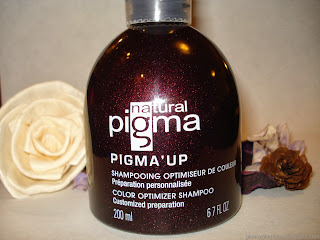 When you are done using it, you rinse it out and place it on the container it came in to dry and when it dries, it gets small again and falls right back into the container on it's own (I thought this was really cute!). 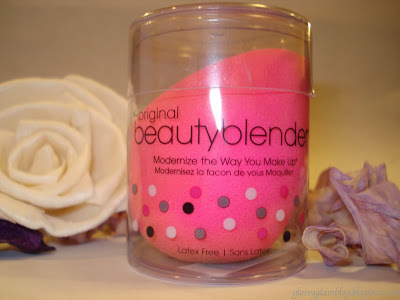 During the recent Beauty.com 20% sale I even stocked up and bought another Beauty Blender 2 pack because I love it so much. I'm not sure how long these are supposed to last but it definitely stays dirty after just one use. I just wonder if it will start breaking down sooner or later. 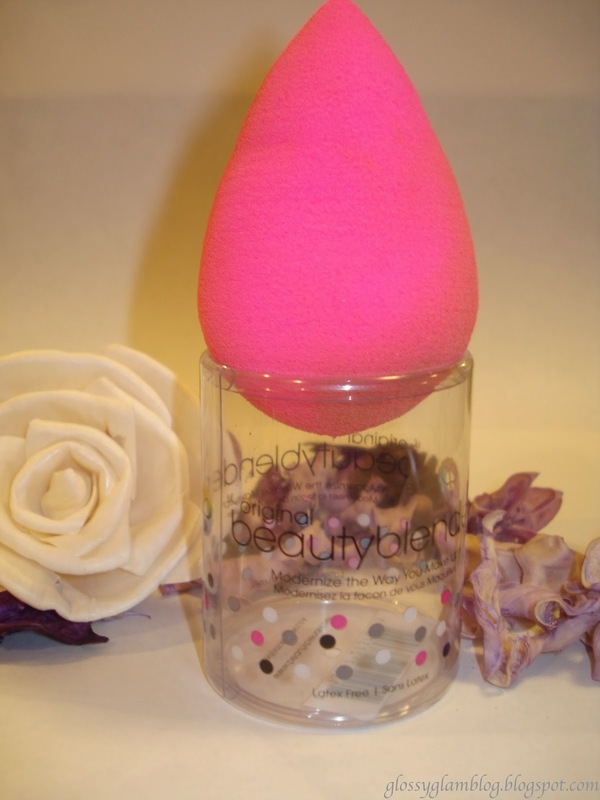 Have you guys tried this pretty little sponge? I hear there are dupes out there, anyone know if those are any good? Thanks for stopping by and have a beautiful day! Last week I went to a StyleFixx Event at the Center for the Arts here in Boston. I used to go to these types of things (Shecky's also offers them) often but they kind of fell off my radar for a few years. A few weeks ago I received a Living Social email for a discount on the ticket prices, so I jumped on it. Two tickets including Swag Bags were $25 (usual price is $30 for one ticket)! sampling from local and national brands. 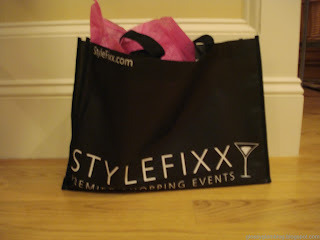 Score our famous StyleFixx Swag Bag filled with goodies. Explore the StyleFixx Wine, Beer & Food Pavilions. Indulge in complimentary Spa and Beauty treatments. There is a little red carpet outside the building that you walk on before someone checks your ID since this is a 21+ event. You then check in and are given an orange bracelet with 4 tear away tabs which are for FOUR free drinks! The first order of business was getting our Swag Bags! We grabbed those and then bee-lined towards one of the 3 bars. They offered beer, wine, and this blush champagne wine thing which I forget the name of. That's what I got. I'm not gonna lie, it wasn't that great. That and the wine were all Barefoot brand which I think is fine. Previous years I remember drinking martinis and cosmos so this was a bit of a letdown. Swag Bags on our shoulders and drinks in hand, we started walking around. There were tons of tables with local jewelry, bag, clothes, and accessories designers, boutiques, salons, and spas. The salons and spas were offering blowouts, quick manis, and makeup application. Seeing as how me and my friend were just going straight home from this (it was a "school night" after all) we didn't care to get a blowout and all the spots that offered manis had HUGE waiting lists. In the end we were able to get a henna color consultation at a Salon in Boston called Albane. After the color consultation you have the option of buying a henna color mix from them for basically any color you want because they mix it up for you. I chose a burgundy color, just for fun. It was $20 for a small bottle and each application is supposed to last about 4 days. I haven't actually tried it yet since I just got highlights which I paid good money for! :) Maybe I'll try it in a few weeks. I also bought 2 "statement" rings. Unfortunately neither designer gave me their business cards so I can't even tell you what table I bought them from. I love them both though! 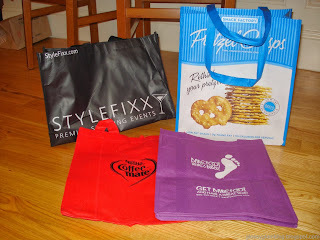 Check out the pics of my Swag Bag below. To be honest, it's the least impressive Swag Bag from these events that I've ever gotten. It was mostly filled with business cards and brochures for services and salons. The only 2 interesting items were a bottle of L'Oreal Mythic Oil and HLCMED Liquid Lift Serum. I'll have to look more into these.